MMD Lip-sync is fun to do... just do it! I got an email the other day asking me “what to do” about his song having no VSQ file available. and…I’ve never in my life seen someone this enthusiastic about lip sync. Most people end up pulling their hair out. Not that it’s a bad thing, it’s just unusual to like lip syncing. I tell you what… don’t get me started… I love this stuff! The biggest hint I can give is to use only one, maybe two of the mouth sliders at any one time. … don’t try to shape a mouth using more than two sliders… you will get confused as you undo the motions. The Grin slider can be set, registered, and forgotten-about until you want to take away the grin. The vowel sounds I register into their home positions often… like right before any new word or phrase. … in Anime, they often use what I call “lip-flapping” motion. They simply open and close the mouth a bunch of times when a character is speaking without regard to the particular sounds involved… and so it looks OK in both Japanese and English! … but I like to be more careful. 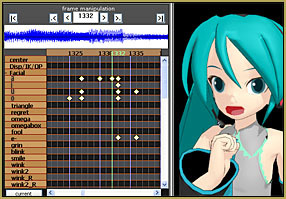 Remember that the B and M sounds require instantly-closed lips… if you are into getting the animation done quickly, you can do all of your lip-sync animation using only the A slider. It has a nice natural shape. … remember to exaggerate the motion… make your mouth-positions a bit larger and more extreme than a real person’s would be so it will look better in MMD. … I also use the “i” slider because it gives the mouth “width” … and either the O or U when I need a “oh” or “uuu” sound. … and don’t automatically use the O for an oh sound if the U looks better… use the U. Remember to keep an eye on the soundtrack’s frequency display above the frame chart… it shows you where words begin and where the sharp-points of the sound are located. I find it better to make the mouth-motion for sharp sound start a frame or two before the spike on the frequency chart. … And push PLAY often to see and enjoy your new mouth motions. Remember that you can set the range of frames to play-back using those windows below the play button so that you don’t have to play the whole animation just to see your latest bit. I tell you what… don’t get me started… I love this stuff! “:o). Do you have any tips for getting the timing right? My lip sync always seems to have messy timing, especially on shorter notes. For short or crisp notes, maybe shape the mouth for the sound a frame, or two, before you see the note in the visual scan. 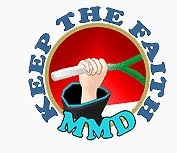 I think MMD (and your brain, really) needs that split-second to catch up with what you are hearing. … As always, each mouth motion has a set-up, a setting, and a finish. Register the mouth so as to have a fixed place to build from as you mouth the next sound. Maybe exaggerate the mouth-action for that short note to make it more obvious than you think you want. I find exaggeration is important… too often a lip-sync looks to mumble… make strong lip-flapping motions; open the mouth more than you might think. … and as the camera draws back from a singing model, that lip motion needs to be more exaggerated so the audience can still see that she IS singing. it’s a “cartoon”; a little exaggeration helps communicate.